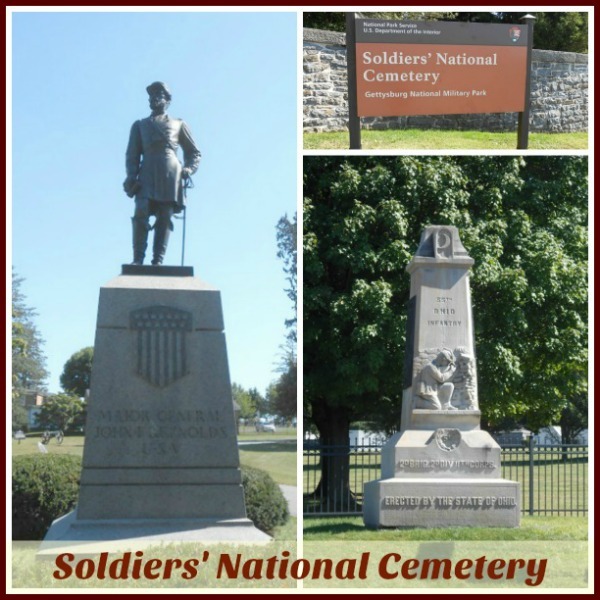 A visit to the Soldiers' National Cemetery in Gettysburg Pennsylvania should be on every traveler's bucket list. This cemetery is within Gettysburg National Military Park and was created for Union casualties, but does have additional sections on their property for other wars that were fought by our great brave men and women, along with their children. * A lot of photographs are included. Please let them all completely load. Thanks! You can visit the cemetery year-round and do a self-guided tour or sign-up for a tour with a National Park Service Guide. You'll want to park in one of the designated parking lots and stop by the visitor's center to pick up a map to help guide you along the way. When visiting, you'll want to be respectful and not walk on any of the graves (stay on the marked paths) and don't sit or climb on any of the monuments. There are benches along the way if you want to sit down for a rest. Please utilize them. We arrived for our visit late in the morning before the weather got too hot. While you'll find some shaded areas in the cemetery, a lot of it is also out in the open sunshine. You can carry a simple water bottle into the park along with you. Please wear comfortable walking shoes, because you'll be doing a lot of walking. It took us about 1 1/2 hours to walk completely through the cemetery, so make sure you allow yourself enough time. As you walk through you'll see a lot of the different monuments and memorial markers along the way. Each of them is well-marked and will give you a little bit of information about it. If you want to remember this information, take a notebook along with you or take a lot of photographs to help you remember things later on. Since it was hot out the day we visited (over 90+ degrees), I opted for a lot of photographs and internet research later on. (Take photo of the monument and then photos of the information plaques or makers located with it). The cemetery is broken down into various sections for each of the various states that made up the union at that time. If you look at your visitor's map, you'll notice that all of the smaller states are around the Soldier's Monument and then they radiate out from there with the larger states (sections) being on the outside or perimeter of the monument. In other words, as we walked into the cemetery we encountered Pennsylvania, New York and Ohio sections and as you get closer to the center of the cemetery where the Soldier's Monument is located, you'll come across the smaller state's sections like Rhode Island. If you're looking for the spot that President Abe Lincoln gave the famous Gettysburg Address, it's a few feet from the Soldier's Monument and is identified by a historical marker. His famous Gettysburg Address lasted 2 minutes in length and you can read all about it on the marker that now stands there. When the cemetery was first constructed it was for those who died in the civil war and their families. However, over the years the government decided to add additional sections to accommodate the graves of veterans from other wars like World War I, World War II, Korean War and the Vietnam War. I read on their website that over 6,000 veterans are now buried in the National Gettysburg Cemetery. In 1865 they started construction on the famous Soldiers' National Monument with the dedication ceremony held on July 1st, 1869. The monument is pretty tall and on each of the four corners you'll find four marble statues representing: history, plenty, peace and war. The statue "Genius of Liberty" crowns the monument's shaft. If you're looking for it, it's just a few feet away from where President Lincoln gave his historic Gettysburg Address. During our visit I took over 200+ photographs and in the coming weeks, I'll be doing a few more blog posts on our visit to the Soldiers' National Cemetery in Gettysburg. If your planning a trip to Gettysburg or a Civil War Military Buff, this is definitely one place you need to visit. Note: All photographs are copyright the Pennsylvania & Beyond Travel Blog. Each photo is clickable. If you click on it, it will open up in a new browsing window and in an enlarged size, so that you can view the smaller details. We keep our images on the blog mobile-reader friendly. Thanks! I have not yet visited the Soldiers' National cemetery in Gettysburg and I would like to do it at some point. I did not know that soldiers from other wars were also buried there. I like the way the burial plots were done by bigger to smaller states.